Kawai piano covers. Suitable for upright or grand pianos. Kawai There are 11 products. 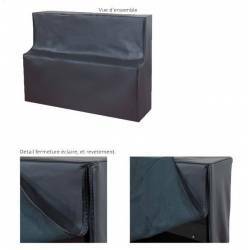 Waterproof cover providing your Kawai grand piano with a high level of protection. 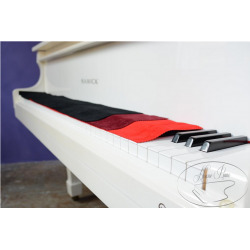 Custom-manufactured to protect Kawai upright pianos, this cover fits perfectly over your instrument and is secured in place using a heavy duty zipper. High quality cover for baby grand piano. Faux-leather outer cover providing ideal protection against water hazard. Padded inner. For pianos ranging from 152 cm (5' 0") to 161 cm (5' 3") in length (keyboard included). High quality cover for medium grand piano. Outer: waterproof and durable faux leather. Padded inner. For pianos ranging from 163 cm (5' 4") to 173 cm (5' 8") in length (keyboard included). Cover designed to fit Kawai RX3 pianos. High quality cover for Kawai RX3 medium grand piano. Outer: waterproof and durable faux leather. Padded inner. High quality cover for semi-concert grand piano. Outer: waterproof and durable faux leather. Padded inner. For pianos ranging from 187 cm (6' 2") to 197 cm (6' 6") in length (keyboard included), such as the Kawai RX5 or Yamaha C5. High quality cover for semi-concert grand piano. Outer: waterproof and durable faux leather. Padded inner. For pianos ranging from 202 cm to 2012 cm in length (keyboard included), such as the Kawai RX6, Yamaha C6, or Steinway B-211. High quality cover for semi-concert grand piano. Outer: waterproof and durable faux leather. Padded inner. For pianos ranging from 217 cm (7' 2") to 227 cm (7' 6") in length (keyboard included), such as the Yamaha C7 or Kawai RX7. 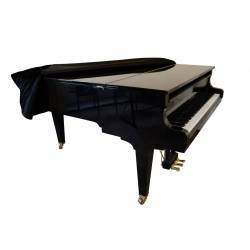 High quality cover for concert grand piano.Outer: waterproof and durable faux leather.Padded inner.For pianos ranging from 265 cm (8' 8") to 275 cm (9') in length (keyboard included). A piano key cover protects your keyboard from dust. Available in 3 colours. High quality soft felt. When choosing a colour for your piano key cover, it is presumably best to choose that of the felt visible above your piano keys.